It's this time of the year again! Let's review all the great stuff that has been happening on Tableau Public in 2015. For newcomers who have known Tableau Public only in its current form, the fact that author profile pages were actually launched just two and a half years ago sounds unbelievable. Yet, go have a look at this July 2013 post and you'll understand where Tableau Public comes from. In a continuous effort to promote the work of all authors, we've launched a Follow feature in October this year, that allows you to follow your favorite authors and be notified of their latest publications in the 'Activity' tab of your profile. So here we are now, with two different Top 5 Authors rankings: Most Viewed and Most Followed. So who is the Most Viewed Author this year? I'll put an end to this unbearable suspense... For the third time in a row (and if you've followed me so far, you know that there's only been three times): La Nación is number one in the category Most Viewed! Congratulations to the whole LNData team for their consistent production of high quality and informative vizzes. It seems clear by now that nothing can stop LNData, as the gap with the second Most Viewed Author keeps widening each year. Yet, all the other Most Viewed but The Daily Reveille are new to this Top 5, so welcome and congratulations to Aneurin Bosley from Carleton School of Journalism and Communication, Belén Picazo from Spanish newspaper El Diario, and Gavin Off from The Charlotte Observer. Wait, but who is the Most Followed Author then? Most Viewed Authors are not necessarily the Most Followed. That's especially true for newspapers, who drive their viewership mostly from outside the Tableau Public community. Indeed, using the Follow feature implies two things: 1. you have a Public profile, and 2. you have identified your favorite authors. 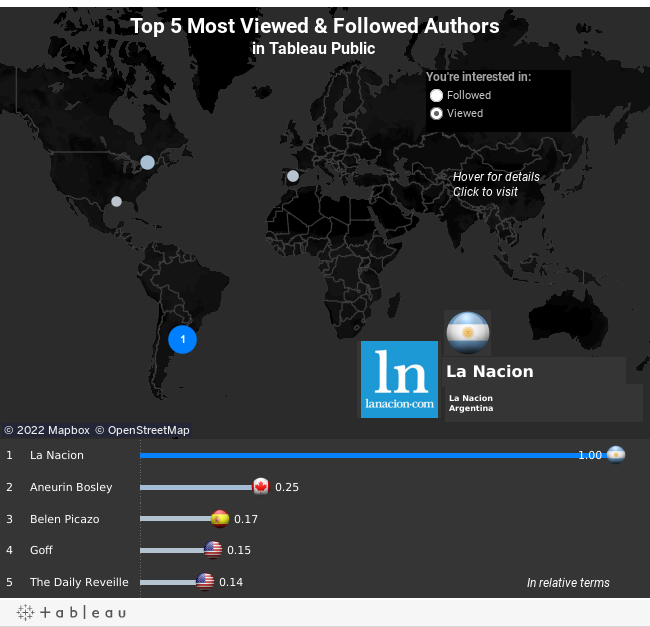 As of the time this article is written, the Most Followed Author in the Tableau Public community is... Our very own Jewel Loree! With her crowd of 241 devoted followers, she's ahead of Shine Pulikathara, winner of this year's Iron Viz Contest and followed by 196 supporters, while his contender in that competition Matt Chambers completes the podium with 179 fans. Adam E. McCann and Robert Rouse are respectively #4 and #5 with 138 and 96 followers respectively. Congratulations to them all. And let's wish all authors an even larger crowd of viewers and followers in 2016!